Cream butter and sugars. Mix in eggs and vanilla. Add in flour, baking powder and soda and salt. Mix till combined.Fold in all chocolate chips and Milky Ways. 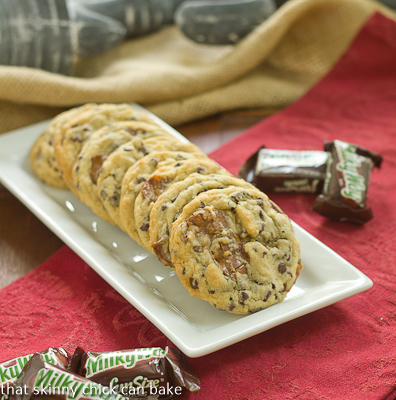 For a rounded tablespoon sized cookie bake 8-10 minutes. If some of the caramel has oozed out of the cookie, use a sharp knife to scrape the excess away from the cookie before they cool.